The flavors of Germany and surrounding regions of Europe that we love include pork, especially smoked pork, cabbage, paprika, sauerkraut, apples, onions, cream, dill, caraway, sausages, beer, butter, and root vegetables. Sausages, of course, are probably the most famous food from Germany. These recipes are flavorful and delicious, designed to satisfy even the heartiest appetite. This recipe is a combination of several from different cookbooks. It has the perfect combination of textures and flavors. This fabulous and super easy recipe cooks to perfection in your slow cooker. This Hungarian recipe elevates plain chicken to a new level. Serve it over spatezle, or little German dumplings. Just three ingredients in your crockpot make this fabulously juicy, flavorful main dish to serve with sauerkraut or cooked cabbage and a spinach salad. This luscious recipe is easy to make and tastes almost like the real thing. Store bought gingersnaps are the perfect finishing touch to the sauce. 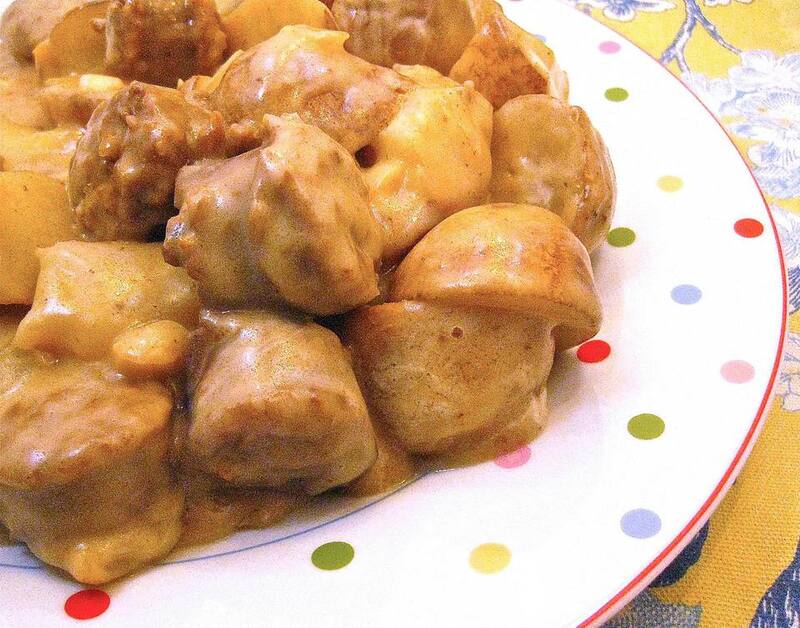 Use your favorite 'wurst' in this easy one-dish meal. This authentic recipe is direct from Germany, via Ellis Island and about a hundred and fifty years. The pressure cooker is a wonderful way to make this traditionally slow cooking recipe in a hurry. Dumplings are very traditional in Germany and Bavaria. This version cooks them to fluffy perfection in your crockpot. Celery salt is the secret ingredient in this super easy, super inexpensive crockpot soup recipe. This classic recipe has been adapted to cook in the crockpot. Tender beef is stuffed with a combination of bacon, onions, and pickles, and cooked in a sour cream sauce. To make this recipe authentically German, buy smoked pork chops. You may need to increase the cooking time by about half if you choose this option. A jar (yes, a whole jar) of horseradish is slathered over this tender roast. Don't be afraid - it mellows while cooking! Serve this excellent side dish alongside roast chicken for a fabulous meal. This super easy version of a classic German recipe is perfect for dessert, breakfast, or brunch. Make it soon. This fabulous cake uses apples and apple juice for the best flavor and most tender texture ever. Did you know that the term 'bundt' comes from the German word 'bund', which means 'a gathering of people'?